Given the amount of attention looming recession calls are getting, we thought it prudent to throw our observations into the hat. 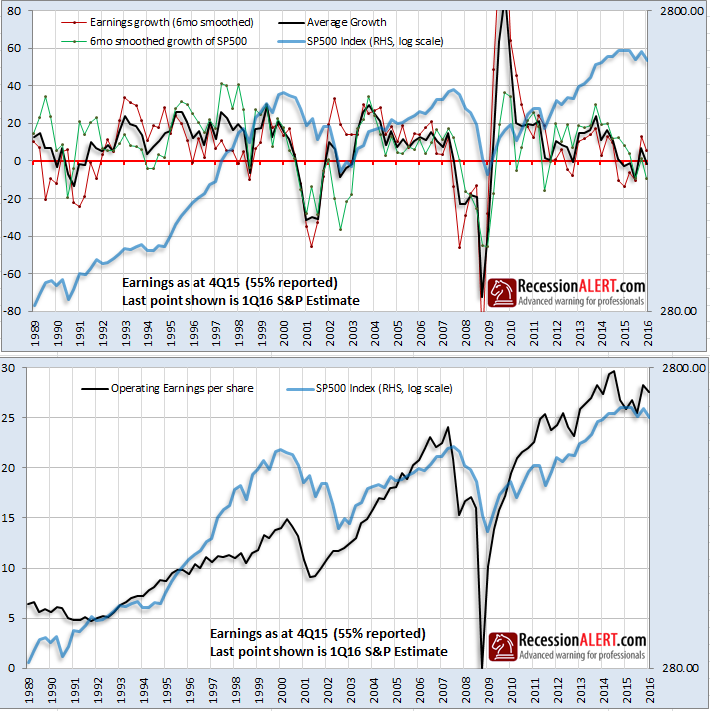 The main reasons for most parties claiming we are in recession are the SP-500 earnings recession, stock markets, the widening credit spreads, Weekly Leading Indicators and Industrial production/Manufacturing. 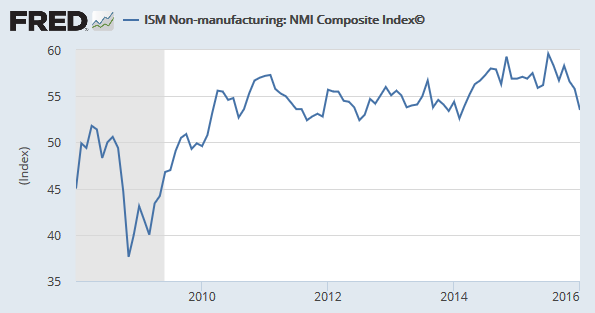 Next week, see the articles about the ISM non-manufacturing PMI crawl out the woodwork. Let’s look at each of these in turn. 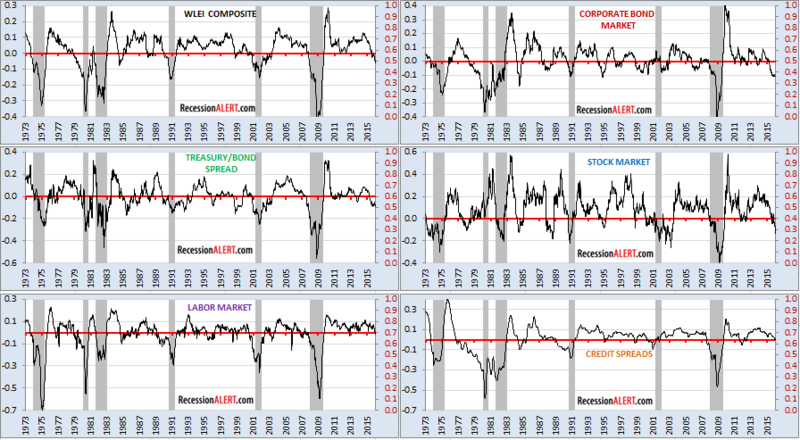 However, we all know the story about the stock market predicting 12 of the last 6 recessions with the false alarms shown above. 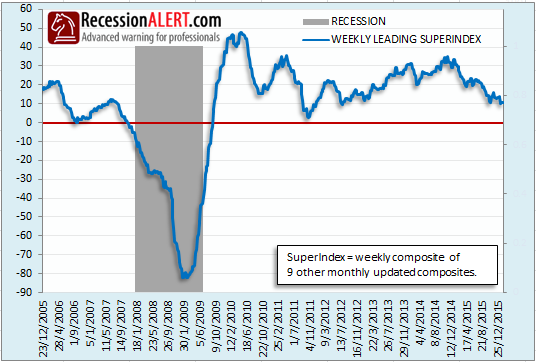 The widely followed ECRI Weekly Leading Index also is flagging recession, but it has done so three times already this expansion. 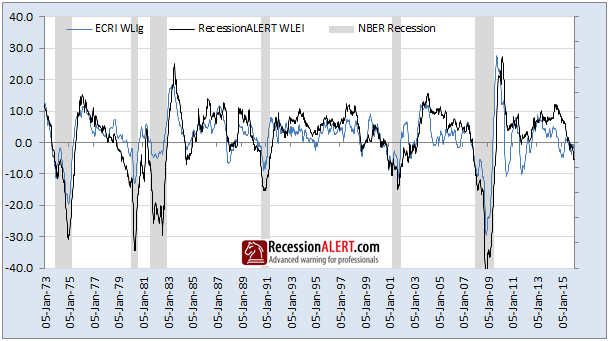 Whilst our own WLEI has not flagged an alert before 21/08/2015, it now joins the ECRI WLI in an emphatic recession call. Also note from the first chart above that there have been 3 false alarms since 1973 with the depth of the current readings consistent with the 1984 false alarm. Thus, whilst the WLEI flags caution we do not use it for performing actual stock market actions at this point. 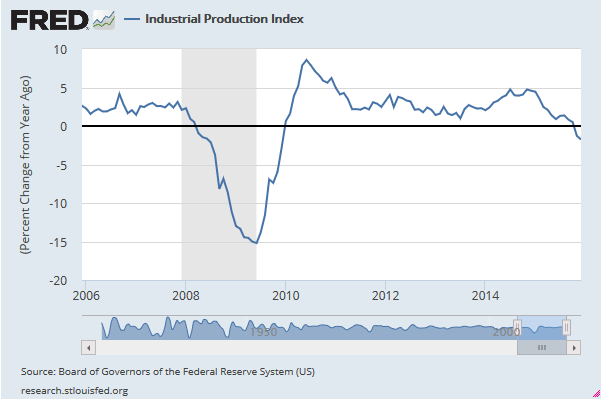 The fifth item hauled out the bag to argue for recession is Industrial Production which is indeed in recession. Unlike past declines in industrial production, the current decline has been driven primarily by the collapse in the utilities industry (weather) and mining (impacted by energy) which make up just 25% of Industrial Production. 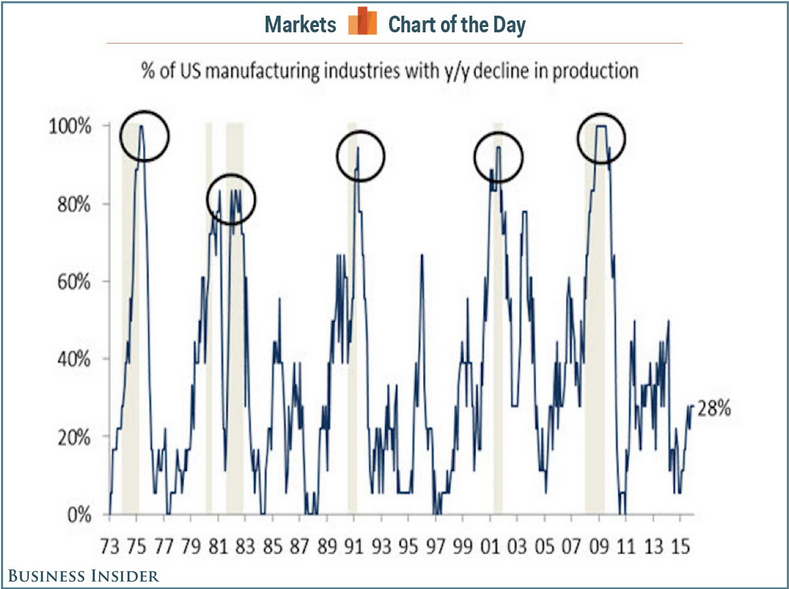 During 1985/6, declining oil prices and a rapidly rising dollar also led to an Industrial Production slump. This did not turn into a recession. There is a great piece on this here. Now we move onto Manufacturing which makes up about 70% of Industrial Production and 12% of US GDP. The output from U.S. factories has been little changed recently, although the main manufacturing indicator being watched, the ISM PMI composite, is indeed below the expansion level of 50. In the last few decades, it was not unusual for the ISM to signal recession as the broader economy remained in expansion. 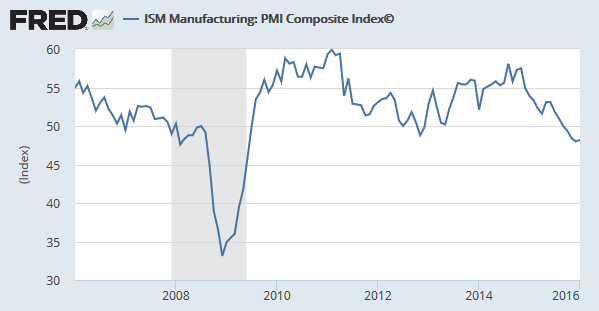 The real rebuttal against the ISM Manufacturing PMI warning is highlighted by Tom Porcelli at RBC Capital Markets who stated “One of the reasons to believe the so-called manufacturing ‘recession’ is likely to be short-lived is that it has been limited to a handful of industries. In other words, it has not been a pervasive slowing.” There is nice coverage on this at Business Insider. There was a disconcerting plunge in January, but no recession signal yet. 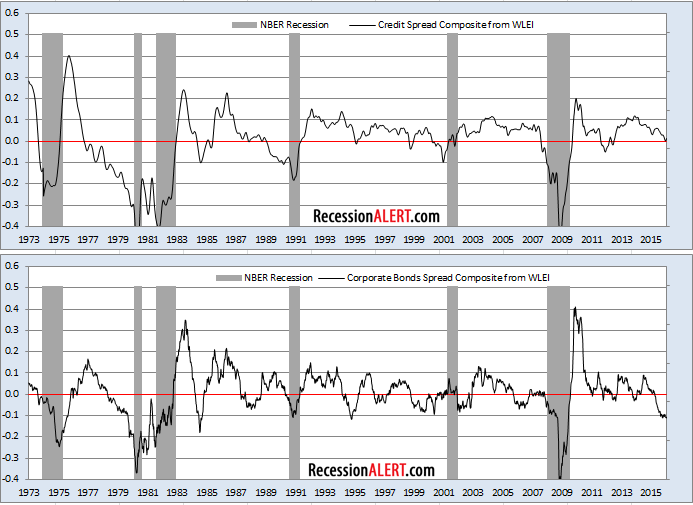 Now lets focus on the arguments AGAINST recession. 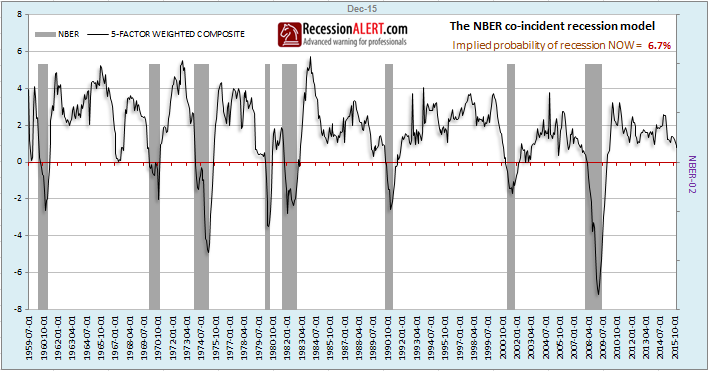 The National Buro for Economic Research (NBER) are the final arbiters of recession dating in the U.S. The NBER does not define a recession in terms of two consecutive quarters of decline in real GDP. Rather, a recession is a significant decline in economic activity spread across the economy, lasting more than a few months, normally visible in real GDP, real income, employment, industrial production, and wholesale-retail sales. To summarize, despite many pockets of disconcerting co-incident indicator weakness, many brought on by the energy and commodities complex, the risk of near-term recession appears low. 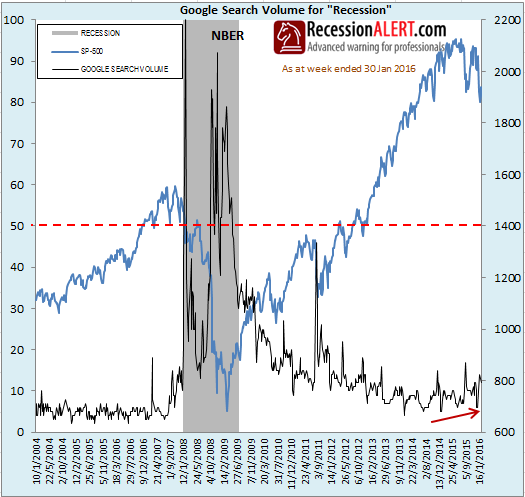 Although many short-leading indicators are showing recession there are not enough of them yet to warrant a confident recession call. 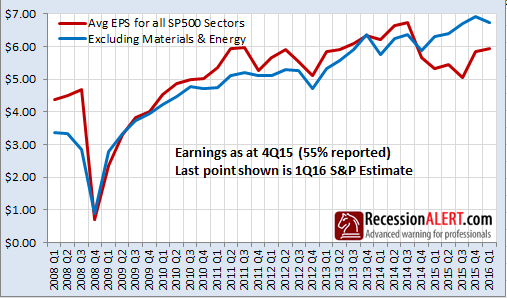 What remains highly elusive is finding long-leading data that points to recession. Just like 2011/12 it is going to make for some interesting times.